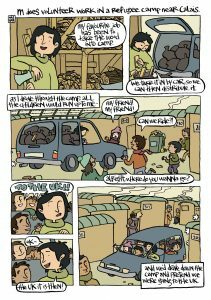 A bitter sweet comic about the wood distribution in the Camp. This is a Comic from a friend of Kesha Niya, she collected this anecdote in the wood barn. Her favorite task was helping out in the Wood storage for chopping the wood and distributing it in the Camp! Thanks a lot Mas Hab for this bittersweet Comic! « Dunkirk Legal team describes the situation of minors in the camp!